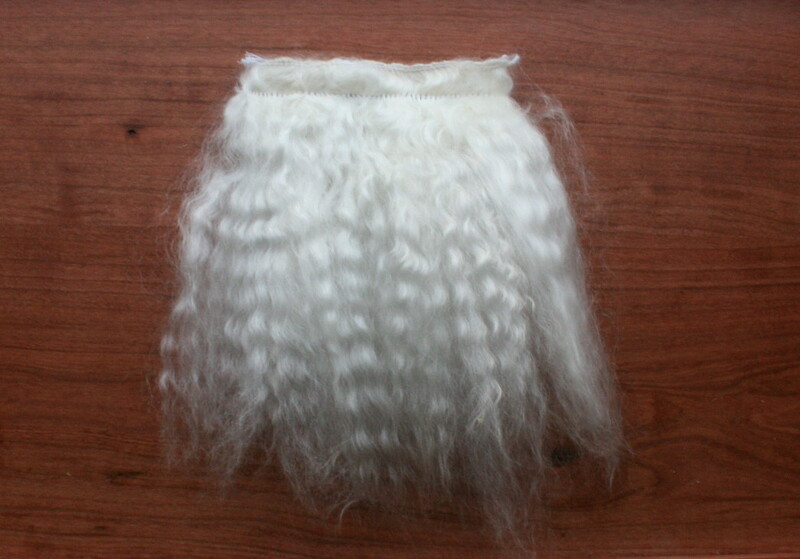 You may use just about any fiber to make a doll wig. I have tried many suppliers and will have for sale those that I found to be a quality fiber and to the correct scale & texture for a doll wig. You will need a metal dog comb and less than one oz of tendrals to start. Carefully hold the lock in place and comb out the cut end a few inches down. Keep holding the tendral in place and comb out the length. You will see a lot of dirt and any leaves/bedding fall out during this, so it is helpful to work on a towel. Carefully lay out your combed locks to measure for length. Some people wash the locks at this point. If you wash now, let them air dry and comb again. Cut long strips of tissue paper and place one on your sewing machine footbed. This is to lay out the locks on while you weft. This will allow all locks to ride through as being sewn as well as to protect your machine from debris and hair being caught inside. Sew on the cut lock end about 3/4-1" in from the end of the lock. Continue this, lock by lock lined up, until the desired length of weft has been reached. Start again from the beginning and sew parallel to the first stitch about 1/4" apart. Continue the entire weft length. Now fold the lock between the two stitched lines with the tissue paper on the outside. Stitch the entire length of the weft inbetween the first two stitches. This will "lock" the fiber into the weft. Now is the time to carefully tear off the tissue paper. 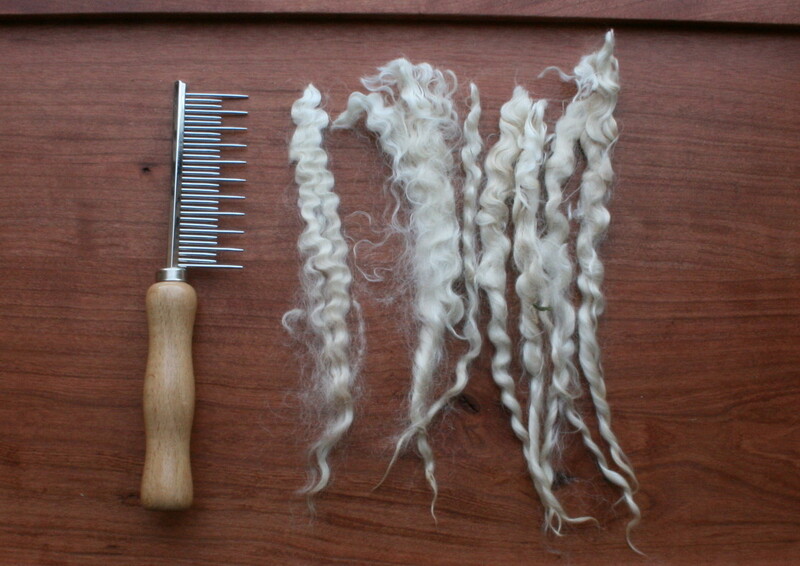 This shows the inside of a wig cap as the wefted strips of fiber have been added. I use twice the amount of a normal weft to sew the part. This is two, double wefts sewn together with a machine. This will make sure there are no bald spots on the doll hair part. Modeling the finished wig is my Ultimate Tour Blythe with her full head of hair underneath. I have carefully put her hair into a Cool Cat Blythe hair net. Once the wig was fully assembled, I washed it in Aveda shampoo. I like to use only natural ingredients on any handmade wig with natural fiber. This last washing you do just as a human head. You will get even more dirt off in this last step. 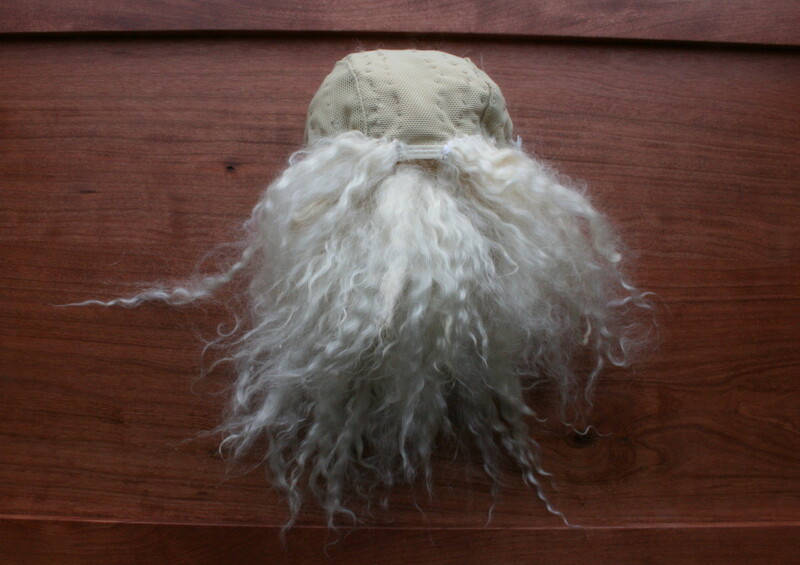 I carefully support the wig and try to keep the fibers in generally the same direction that they were sewn on in. Rinse under the faucet. Then I condition the wig in the same manner, rinse and let air dry. Please feel free to email me with your needs.